Many commentators have apparently missed the point about Abu Qatada‘s successful appeal against deportation. The Special Immigration Appeals Commission (SIAC) accepted the Jordanian government’s assurances that Qatada, if returned to Jordan for trial on old terrorism charges, would not be tortured and that the government, from the King down, would do everything possible to ensure him a fair trial. The problem is over two statements, made years ago, which it’s generally agreed may well have been produced by torture. These were used in evidence against Qatada when he was tried in Jordan and convicted in absentia, and are now in a sealed file of evidence used at the earlier trials. If they had the power to prevent those tainted statements being used again when Qatada is re-tried after being deported to Jordan, the King and his government would clearly do so. The SIAC judgment of 12 November (pdf) accepts that assurance: “with the significant qualification that all members of the executive government have made it clear to their British interlocutors that they cannot interfere in judicial decision-making“. The SIAC judgement exhaustively analyses Jordanian law and judicial processes and comes to the definite conclusion that re-use of the two tainted statements at any future trial of Qatada is a real possibility. This would not only contravene Qatada’s human rights under the European Convention (as the European Court has confirmed, Britain being a signatory to the Convention and hence legally bound by it) and under the UK Human Rights Act (as SIAC, a British court, has confirmed): it would also be in flagrant contravention of the UN Convention Against Torture, to which Britain and Jordan are both signatories. It is up to those who shrilly denounce SIAC’s judgment to state the grounds on which they disagree with SIAC’s carefully argued conclusion that under current Jordanian law and practice there must be a real risk that the two statements will be used in evidence against Abu Qatada if and when he is re-tried in Jordan. This is our open judgment on that appeal. There is a closed judgment, in which we have set out our closed reasons for reaching the same conclusions as those set out in this judgment. In other words, SIAC’s judgment that Qatada could not lawfully be deported to Jordan, because of the risk just described, was also reinforced by additional classified evidence which is too sensitive to be revealed publicly. There has been much criticism of the provision whereby SIAC may hear secret (“closed”) evidence, not revealed to the appellant or his lawyers but heard in closed session at which the appellant’s interests are looked after by a special advocate, a barrister with the necessary security clearance. This is not the place to debate the rights and wrongs of that procedure: the point is that SIAC had other, undisclosed grounds for reaching the conclusion it did, in addition to those in its lengthy published judgment. Enough is enough. Put this terrorist on a plane and send him home and worry about the European Court afterwards. There are times when we need to put the public interest in front of the European Court and this is one of them… We should not be kow-towing to this Mickey Mouse European court. In vain Shami Chakrabarti of Liberty tried to explain to Mr Bone that he was calling on the government to disregard the finding of a British court, not just a European one. Mr Bone wouldn’t have it. 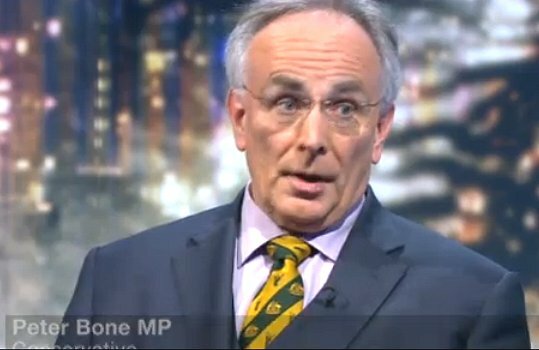 A skim through Peter Bone’s voting record on civil rights issues in the house of commons shows that his public incitement to law-breaking last night and this morning was entirely in character. Finally, where was the voice of Labour in defence of the European Court of Justice, the Human Rights Act and the Special Immigration Appeals Commission when the home secretary, Theresa May, performed her predictable whinge in parliament about the SIAC judgment yesterday? Her Labour Shadow, Yvette Cooper, far from robustly defending the rule of law and respect for the fundamental rights of even the most unsavoury of the inhabitants of our country, instead outdid Theresa May in denouncing SIAC, the European Court, the home secretary’s record of attempting to deport Qatada, and the government’s action in “watering down” New Labour’s infamous Control Orders. Ms Cooper demanded that Qatada be held in custody (contrary to SIAC’s decision) until he could be deported, if necessary under the government’s Control Orders Lite, despite the fact that he has never been charged with any offence in this country, still less convicted. She twice recited the tabloids’ cliché about Qatada being allowed “on our streets”, as if this alone represented a threat to national security. Once again Ed Miliband’s One Nation Labour follows Blair’s old, discredited New Labour, positioning a once great liberal party to the authoritarian populist right of one of the most reactionary Tory-led governments in modern British history. If this represents the convictions of Labour’s front bench, they are in the wrong party. The only other explanation is a tremulous fear that the tabloids and the Murdoch press (and their political adversaries) will accuse them of being ‘soft on crime’. But cowardice is no excuse. Time for some backbone, Ed, Yvette and Sadiq! Time for some backbone, Ed, Yvette and Sadiq! If only. I’m afraid it runs deeper than that. Historically (well, at least since George Wigg) Labour in government have been dreadfully submissive to the security establishment, and even the police. Every increase in the time suspects can be held by the police without charge has happened under Labour, from 1974 on. As you know, there were multiple major terrorist incidents under Thatcher – including an attempt on the Prime Minister’s life – and not one of them prompted the government to rush new anti-terror legislation through Parliament. Even getting a grip on ACPO was beyond Labour. I don’t say this as any friend of the Tories. The trouble is, when they return their historic Europhobic, judge-bashing, lock-’em-up form – as they inevitably do – Labour have got nowhere to go other than trying wretchedly to outflank them on the Right. Brian writes: Thank you for this. I’m very much afraid you’re right. I find myself wondering if they are the ones in the wrong party, Brian, or you. Your noble aspirations for the Labour Party have disappointingly little in common with its reality, even under the so strongly desired new leadership, supposedly a move away from Blairism. Maybe, with our ideals of a better world, we are just anachronisms? Brian writes: I persist in hoping that you’re wrong, and that One Nation Labour will eventually return to a modernised version of the party that I joined in the mid-1950s. At present I often fail to recognise it as the descendant of that party of bold reform, innovation, fairness and a fearless commitment to liberty and human rights. I agree with everything you write (except some of the Eatanswill stuff) but would myself take a more radical view. I don’t really believe in what is called Deportation with Assurances. I don’t think we can rely on the assurances we get from governments that they will not use torture. I remember for example that at the time HMG were trying to negotiate such assurances with Libya, we had separately signed an agreement with the Libyans about improving the arrangements for the grant of visas. It turned out to be worthless. When I tackled Qadhafi’s cousin (an old friend who was often helpful) about it he made some enquiries and then told me that unfortunately we had negotiated with the wrong people: the Foreign Ministry had signed up, but they were not responsible for visas. Of course, Qadhafi’s Libya has gone thank God, and there is nowhere else quite like it. But what my friend really meant, I think, was: when we see our vital interests are at stake we are not going to let agreements tie our hands. It would be nice to imagine that this kind of thinking is limited to a few near-rogue states (although unfortunately they are probably the states with which we would want to negotiate Deportation with Assurances). But not so – it is not far removed from the thinking which led Tony Blair to write on the FCO legal advice telling him that the Iraq war was illegal “I just don’t understand this”, and then ignore it. I was impressed by Richard Norton-Taylor’s article in the Guardian (http://www.guardian.co.uk/commentisfree/2012/nov/13/abu-qatada-english-court) arguing that Abu Qatada ought to be tried in Britain, or else released. Maybe it can’t be done under present laws and procedures. If that is so, Government ought to be bringing to Parliament changes which will ensure that it can be done in future cases. Otherwise we will be obliged either to send people home to possible torture, unthinkable in my view, or to offer safe haven in Britain to anyone in the world smart enough to forge a passport or find some other way through our overstretched controls. But I just wanted to correct the widespread misconception, expressed e.g. in yesterday’s Guardian editorial, that this was the issue surrounding SIAC’s decision against deporting AQ to Jordan. In the case of Jordan, unlike places like Gaddafi’s Libya, I agree with Theresa May (for once), Yvette Cooper (also a rare event), the European Court and SIAC that Qataba is virtually certain not to be tortured if returned to Jordan, and extremely likely to get a fair trial, were it not that the Jordan government from the King down admit that they couldn’t prevent these two old documents, probably produced long ago by torture, being used again at Qatada’s new trial if we sent him back. They have been unable to give an assurance on that point so the question of trusting or disbelieving their assurances doesn’t arise. I suspect (without having a shred of evidence for my suspicion) that the reason for the failure to charge, try and convict Qatada in the UK for any of the crimes he must have committed while he’s been here, especially given the ludicrously wide scope of some of the anti-terrorism laws which New Labour lumbered us with, may be that when he was at some stage in a degree of cahoots with MI5 (as confirmed by the SIAC judgment), he may have been given a qualified promise of immunity from prosecution. Be that as it may, I don’t believe for a moment that after everything that’s happened Abu Qatada would represent the slightest threat to our national security is he were to be released tomorrow morning “onto our streets”, as the tabloids say in fake horror. The cops and security sevice will watch him so closely that he won’t even dare to park on double yellow lines. Basic surveillance like that will cost a fraction of what it would cost to send him back indefinitely to Belmarsh, still not charged or convicted of any crime, as Yvette Cooper is demanding. But the likeliest outcome is probably new legislation by Jordan prohibiting the use in evidence of the two documents, probably tainted by torture, which are it seems the sole obstacle now to deporting him. Would you include America in the list of countries known currently to torture people? I see that my one-liner above has been put to the test in the case of Abid Naseer, suspected al-Qa’ida terrorist who a British court ruled could not be extradited to Pakistan because he might be tortured but who has now been extradited to America following an unsuccessful appeal to the European Court of Human Rights. It would be comforting to know that his lawyer argued that he might face water-boarding or other torture in America, and that the court heard satisfactory evidence that it could be excluded. But I have not seen any report to that effect. UK prosecutors said there was not enough evidence to charge him. However, the US wants to put him on trial, arguing the Manchester plot was part of a wider conspiracy to also bomb New York. Alleged al-Qaeda operative Abid Naseer had argued he could be tortured if returned to Pakistan from the US. The US wants to put him on trial for his part in alleged plots to plant bombs in the UK, New York and Norway. He denies the allegations. His lawyers had argued his extradition should be halted because the US could later deport him to Pakistan where he could be tortured or killed by Pakistan’s secret services. In January 2011, a British judge approved Naseer’s extradition. The judge acknowledged there was a “very real risk” Naseer would be tortured if the U.S. ultimately returned him to Pakistan but said he believed the U.S. justice system would not ignore that concern.